Today is a very happy day (other than the fact that it's the first day of school for my boys, but we're not going to talk about that). Instead we are going to talk about Becky Higgins' new photo pocket and envelope pages. I'm so excited about all the new styles that came out recently! And I'm extra excited that I get to give a set away today! To enter the contest, just leave a comment on this post by tomorrow (Tuesday) night at 10 pm central. Contest is open to U.S. residents only. Now to share week 24... I saved this week until I could include Design J because I knew I would have lots of extra photos for our vacation week. 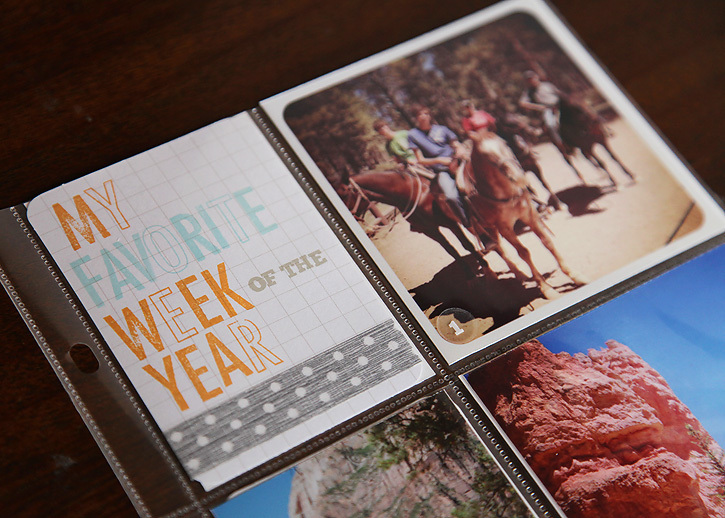 I love the new styles that allow you to add inserts of extra photos without totally covering up the second half of your week since they are narrower than 12 inches. Check out this post on Becky's blog for a description of all the new designs. 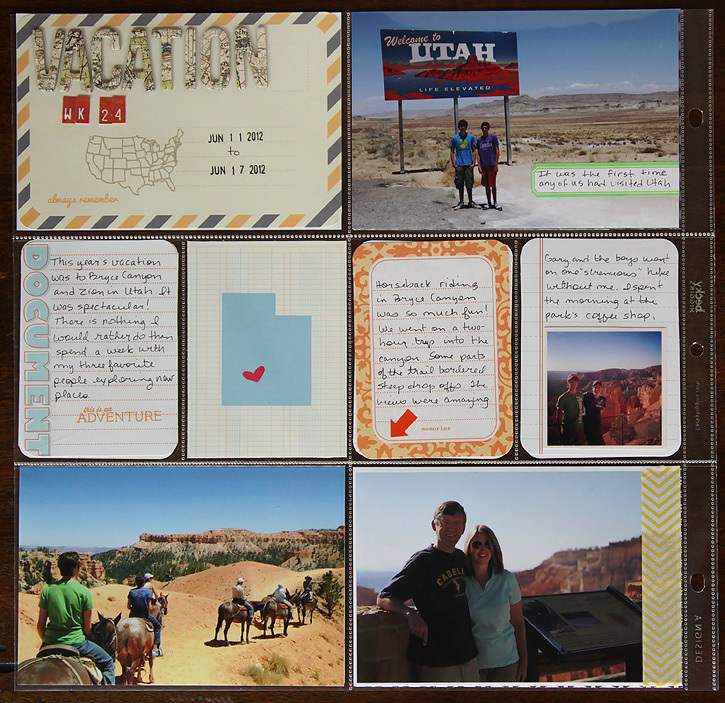 So here's my layout all about our vacation including the insert. **I spelled out the words on the mini-title card with the Stepping Stone Alpha stamp set from Studio Calico. The tiny letters that spell "of" and "the" are from a stamp set that was only available with a stamp class at Studio Calico last month. 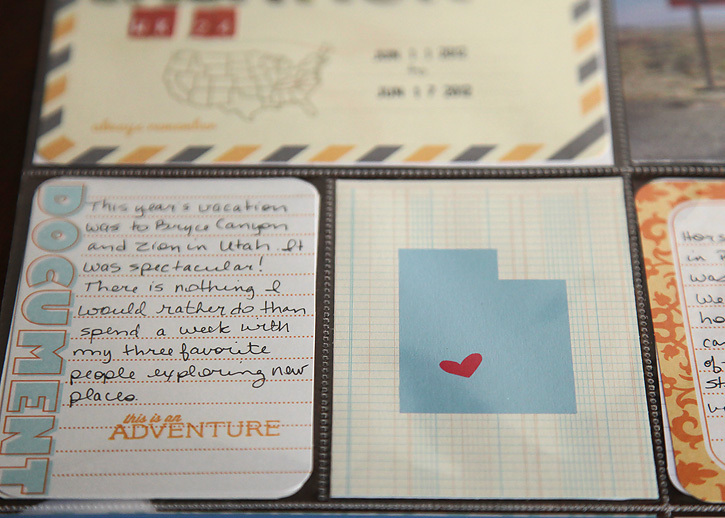 **So many of you have questions about the letters and map stamp I used here. The letters are American Crafts Thickers by Studio Calico. The style is Abroad Everywhere. The stamp is a Studio Calico stamp set called Adventure. Unfortunately, I don't think either of these items are still available so if you really want them you may have to check ebay. Don't you love my state of Utah card? I downloaded a set of cards that includes every state here. They come with a black background and white state so I changed mine up in Photoshop by adding one of the digital Clementine papers to the background and changing the color of the state with a color overlay layer style. Okay, don't forget to leave a comment to enter the contest! I'll post the winner on Wednesday. Good luck! **The winner of the giveaway is #72 kristy.lynn @ kristy.makes. Congrats to Kristy! I hope you enjoy the new products! Love how you used the inserts! I am toying with buying another set of pocket pages for the instagram pictures that are also part of the weeks I've put together! Love the use of the new plastics! Oh I'd love to win this! Especially since I have so many odd sized pictures. I'd love to put something like this together for myself! Love Wildblueberry Ink's state cards too Deb ! Looks like you had a wonderful holiday what a great memory preserved. Love your documentation of the trip. I remember seeing your photos on Instagram, and we were heading to some of the same parts of Utah 2 weeks after you. Thanks for the giveaway! Love your ideas and pictures. Gives me ideas on what to do with having 2 boys. Thanks for sharing. These are great! What a lot of fun photos! this is awesome! Project life is one of the best ways to remember everything that is going on and never forget the little things! The new products are just fabulous! I would love to win. Thanks for the chance! Fab pages! Thanks for the chance to win! How fun those state cards are! Great sharing again. I cannot believe your boys are back at school, the children here have another month off! Great layouts! Thanks for the giveaway! These are great pics I love vacation with my family just the best time and what great ideas!!! Can't wait to scrap my vacation. What a wonderful blog you have, I could spend all day exploring it. Thanks for the chance to win some goodies, I will be checking back often to see your new creations! Love the pages you did from your vacation! How great it must be to have it documented already! One of the great things about Project Life, I guess. :) Thanks for hosting a great giveaway! love the set up ! utah makes for a great vacation ! It sure does! I want to go back!! The new layouts are so awesome!! Totally add a lot more options for the weeks :) Thanks so much for the chance to win! I love all the new plastics! Love your layouts. Thanks for the giveaway! The vacation title is made out of American Crafts Thickers - Abroad. Feel free to email me any questions you have or leave a comment! I am in love with this system! I have to start taking more pictures (and vacations!) so I can record them! Love your layouts!! & would love to win, thanks for the giveaway! Thank you for sharing! They look amazing! I am just discovering Project Life and I am so excited to start!!! I'm anxiously awaiting the core kits to be back in stock! Thanks again! Beautiful!!! I need to get back on the PL wagon! Thank you, thank you!! What a fabulous opportunity to win some of these fabulous products! I just placed my first order for some of the Project Life products yesterday and I'm ***so excited*** to get started when they arrive!! Thanks for the chance to win the new plastics! Love your layouts, great ideas! I love all the new options Becky has, and thanks for offering the giveaway! This is my first year doing PL & I love it. Thx! Love the "state" journal cards. Thanks for the chance! What a wonderful and simple way to remember the important and sometimes forgotten memories in life. Thanks for the chance to win! I've got those state cards in my shopping cart right now...I'm going to get them printed and use in a special 50 states album. That sounds awesome! I'd love to see it when you're finished! I love what you do with the Instagram photos! And combining the state graphic with the digital download is so clever too. I love all the inspiration from the creative team. I love Project Life and I'd love to win some of the new plastics! They look great and I can't wait to use them! I do love the Utah card as well your PL. I plan to do PL next year. Thanks for a chance to win. 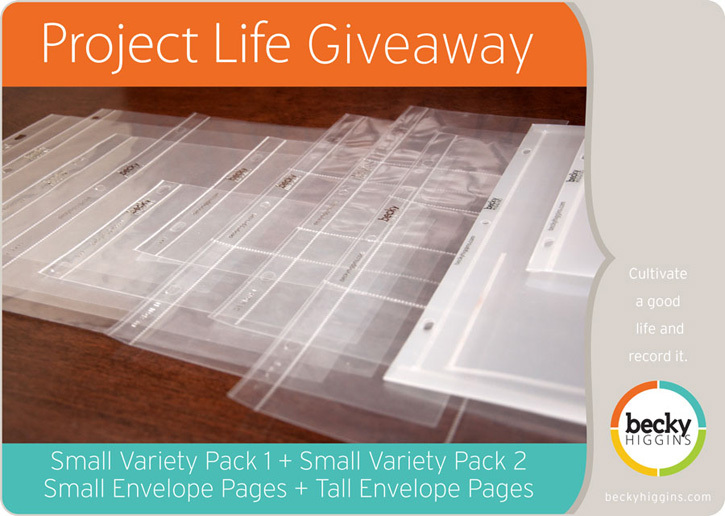 I have been doing Project Life from day 1 and would love an opportunity to win the new plastics. Thank you! i'd love to start using project life!! Love the vacation pics - thanks for the chance to win! Thanks for the chance to win these awesome plastics! Love your layout!! simple and awesome! Great layouts! Thanks for the chance to win. Love your layout, just perfect for your vacation photos. 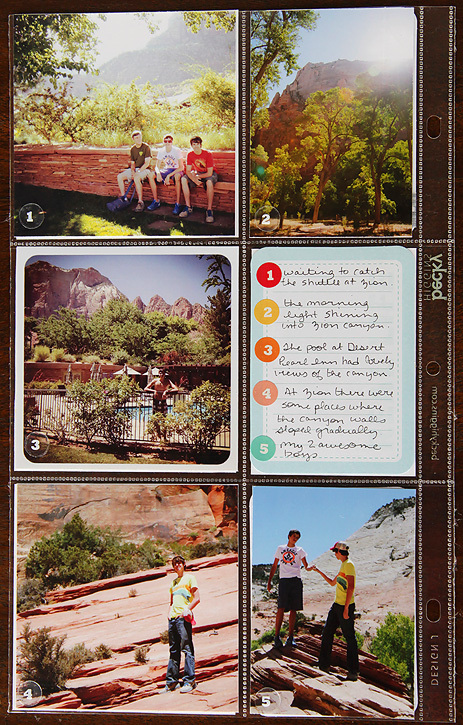 I really love what you're doing with Project Life. Thanks for the opportunity to win the new plastics! Thanks for sharing your layouts. I love the new plastics designs. I love those layouts. So many more opportunities with these plastics. Love your pages!! Love Project Life!! Love the pages and Project Life! I really love how you can have the same supplies as others and yet they are so easy to personalize!! Thanks for the chance!! Beautiful pages! Thanks for the giveaway! Great use of the insert to add more photos! Thanks for the inspiration and chance to win! I love this spread! The "vacation" card is cool: I've never seen those map stickers before. Awesome! They are American Crafts Thickers - Abroad, but I'm not sure if they're available anymore. I totally love the vacation spread. I have a mini book that I started a year ago from our Germany trip...I am falling more and more in love with project life. thanks for the chance to win! I've always loved your style! That's for the opportunity to win some plastics! I love your pages and would love to start using Project Life products. i'm so excited about the new plastics i can barely contain my enthusiasm! i loooove this spread!!! Looks great! Love the states cards! Your pages look fabulous. Thanks for sharing. And also thanks for the opportunity to win more plastics! I am so incredibly thankful that Project Life is in my life. Love all your ideas. Thanks for the giveaway. Love your pages! Cannot wait to get some new plastics so I can "play"! Thanks for a chance to win! 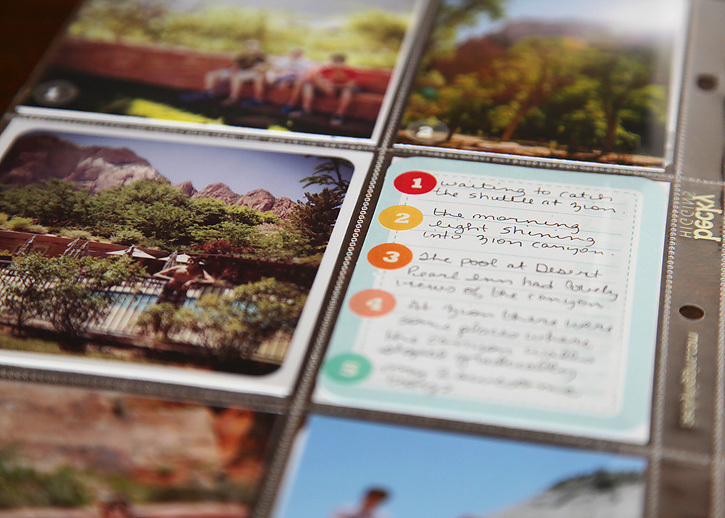 I love the way you incorporated your vacation pics into your album! Your pages are terrific. What an inspiration you are to all of us. Thanks for sharing. I'd like to try these too! Thank you for this giveaway! I love the new plastics and would love to give them a try! Thanks for the chance! I love Project Life. I have been trying to decide which of the new plastics I need, they are all great. I love how you used one of the new plastics. Thanks for the chance to win! Great PL spread and great new plastics! I want to try them all! My goodness you have been working hard! That is a great way to illustrate your photos. I am the laziest scrapbook person ever and one of my daughters does it as a business. See sharp contrast. I love her anywho. Thanks for stopping by my post. Would you like to join? I'd love for you to. Always love looking at your pictures...somehow I lost you in my feed but I'm back to following again! Thanks for the great opportunity to win new plastics! I love Project Life! I just used design A for my son's star of the week project that he took to school today. Easy way to show different pictures that don't go together and having a way to talk about them with out attaching them to paper that later I would have to try and take apart. 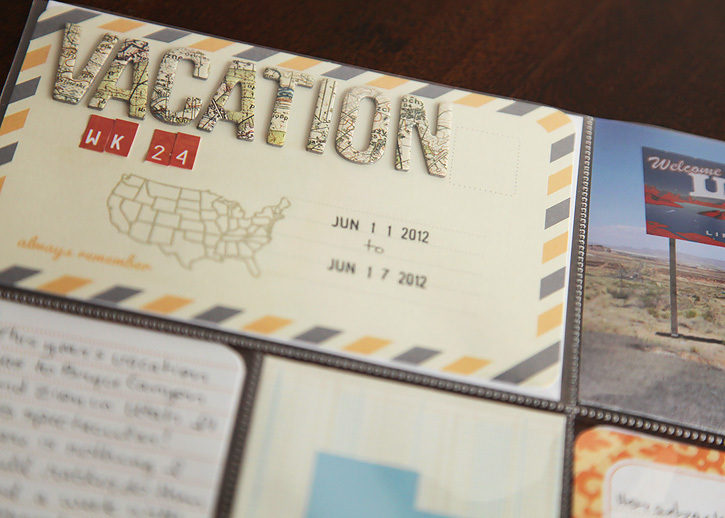 I can NOT wait to start Project Life on Big Picture Scrapbooking. I love the simplicity! Where did you get the US card / stamp?? The stamp of the United States is a Studio Calico set that came out a few months ago. Unfortunately, I don't think it's available anymore. It was called the Studio Calico Adventure stamp set. I bought a couple new plastics when they came out, but I wasn't able to get much, so would love to win some! P.S. looks like your vacay was great! Would love to win this! Thanks for the awesome giveaway (and love your vacation pics!). Would love to win these awesome plastics!!! Love your pics and the way you documented an awesome vacation. Love it! Enjoy looking at your PL album. Thanks for sharing and thanks for a chance to win. Love your project life spread. Thank you for the chance to win. I love the Utah card! Thanks for the chance to win! Thanks! The map letters are American Crafts Thickers - Abroad but I'm not sure if they're still available. The mini-title card was made with stamps. They are the Studio Calico Alpha stamp set. I had to buy mine on ebay because they are out at Studio Calico right now. *Jumpy claps* Still haven't ordered my kit but maybe this is just the motivation I need! I love the Utah card! I am just getting started with Project Life. I love it. Wow great layouts for Project Life! I just got started on my Project Life, hope to get in the full swing of things soon! Thanks for a chance to win these! And thanks for the inspiration - I am working on vacation pages right now & I love that insert page. It's perfect for extra pictures...and for memorabilia from my trip! They are American Crafts Thickers - Abroad (Everywhere). I'm not sure if they're still available. You might be able to find them on ebay. Love it! Thanks for the chance too! Looks like you had a great time! I love the map "Vacation" letters! I'm going to have to find some of those. Thanks for the chance to win! Whoa, those are some pretty pictures. Love the use of the new plastics! Thanks for the chance to win! Count me in!! :) Can't pass a chance to win some PL goodies! I love Project Life! I can't wait to see the new designs! Thank you for sharing! I miss Utah a lot! I like the state cards...great idea for family vacations! Thank you! I would love to try the new plastics. Love your pages as always, Deb! I'm especially loving the new J style page protectors. Can't wait to get some of them myself. Thanks for the opportunity to win the new plastics! 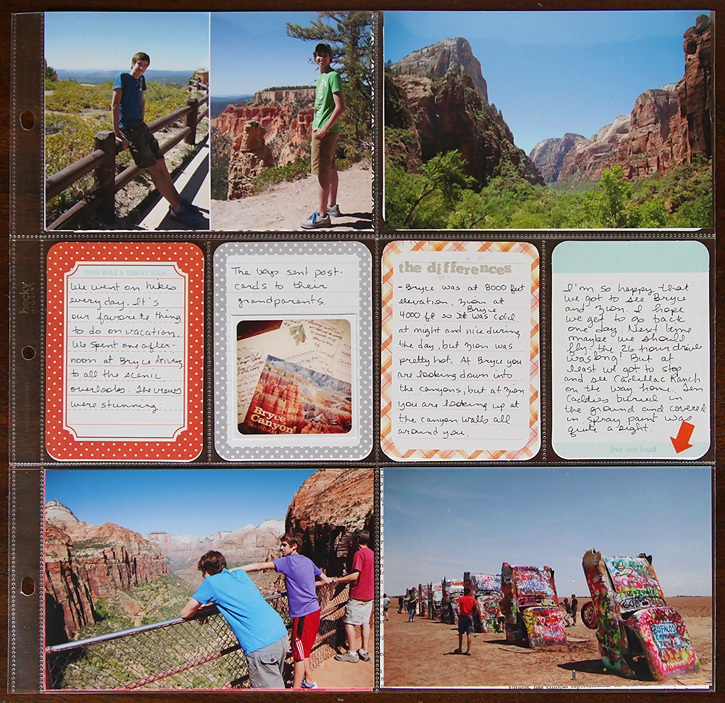 I love your pages and how you did the Utah card. I have a Slice Travel design card that has the states on it. This inspires me to use those state designs for some of my journaling. Thanks for the chance to win some of the new products. I'm so glad you mentioned this! I have the Travel design card too, but I hardly ever think to pull out my Slice. I'll have to remember I can cut out state shapes! I love your pages -- and would love to win the giveaway! I started Project Life a little over two weeks ago and LOVE IT! I also love your pages and have looked at many of yours already. You do a great job! I love that you and other members of the creative team post pictures on your blogs of your own Project Life albums. I love seeing how extravagant or simple I can go depending on how my life is going at any moment! I love your work and I love Project Life. Thanks for the chance to win. Love your layouts! The "vacation" letters are too cute! Thanks for the chance to win! Deb -- i am a dork! You have joined me and I have thanked you and I am suffering from a senior moment...... that I dread to admit. I would love to play with all the new stuff! I am new to Project Life and am trying to patiently wait for all the products but its not working! I have some vacation photos that I would love to scrap as you have! I think I will have to add these to my PL! Love this. Thanks for sharing your week, which looks so fun, and for the chance to win! I love the state with the heart. Your layouts look great. Thanks for the opportunity to win. I love the versatility of the new plastics! I love the smaller size of the Design J too! Great layouts! I love your vacation book! Thanks for the inspiration and giveaway opportunity! The new plastics looks like fun, but seeing them "in action" so to speak made me even more excited! Your whole layout (insert especially) looks awesome - thanks for sharing and thanks for the chance to win! This is great!! I love the insert page! I can't wait to learn more about and start doing PL!! Have lots and lots of photos to get into albums... Would love to win some plastics! Thanks for the opportunity! Thanks for the opportunity to win. I love your pages. Can't wait to get my pictures in an album. Beautiful Pages! Thank you for the give-away! Oh I hope I win! I love all of Becky's products! Oh I would love to win these plastics and try them out. I am going to get my first PL core kit! Love your pages! and I'm loving the new pages from Becky!!!! 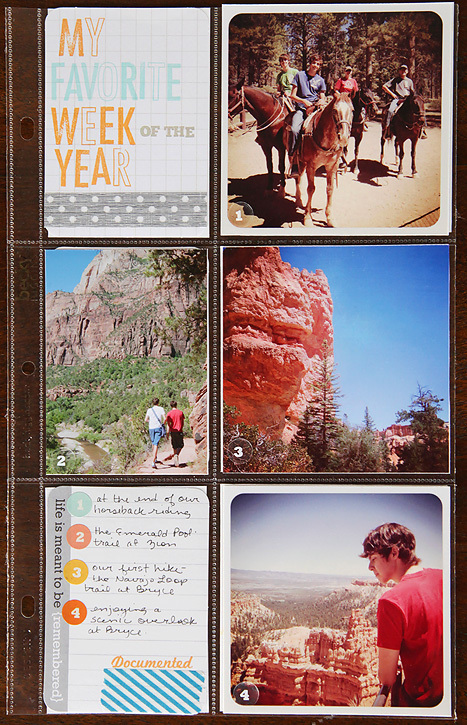 Looks like a fabulous vacation and love your layouts. Loving the new plastics too, thanks for the chance to win such a great giveaway. Way cute! I love your Utah state card, thanks for sharing the link! And thanks for the chance, would love to have some new plastics for my pl! I'm new to Project Life and still patiently waiting for the Core Kits to restock. Love your vacation pics, looks like a fabulous time! Thanks for the chance to win! I have been stalking Project Life for a year now (said I would start last year but didn't). I would love to win something to help kick start an album! Your Week 24 pages look great! I would love to win those! I can't wait to get started on PL. Love looking at your layouts. That is such a great addition to the project life album. Would love to win!! I love the new page protectors... no more waste or trimming down the 12x12 ones. Thanks for the chance to win! Thank you for the opportunity to try these out! Great giveaway! Thanks so much for sharing your layouts! So much inspiration to be had! I love Project Life! 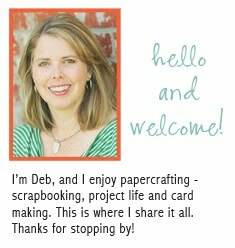 Deb- I love your pages and tomorrow is my birthday so I would love to win! Love all your fresh ideas and love PL plastics! Love Project Life! Thanks so much! I am a recent project lifer and so very excited about it. 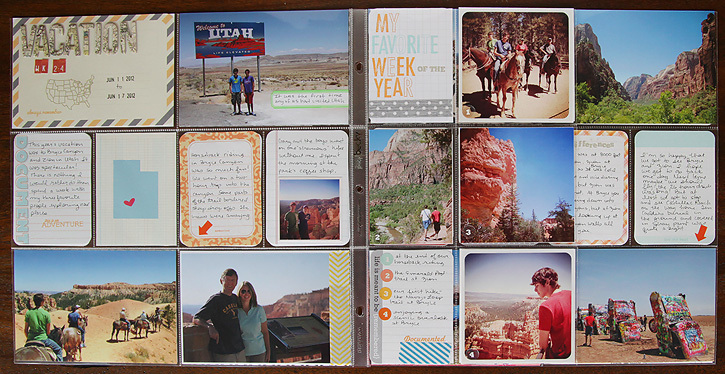 So much easier than the typical scrapbooking that overwhelms me. Love how your album is coming together. Thanks for a chance to win. Love the new plastics and it looks like I would love to visit Utah! Love the layout! Thanks for the opportunity! We got to visit Bryce Canyon a few years ago. My hubby has been looking forward to going back ever since! Maybe next summer. Thanks for the chance to win! I would love to win the new plastics! I love the way you did this layout! love the 3x4 state card! Love your design! I would love to win these pages! Thanks for the chance to win! Great pages too! Excited by all the possibilities with these new plastics! Can't wait to try them! Love your pics and thanks for the chance to win the plastics!! Thanks for the chance to win. Can't wait for more inspiration on how to use the new pages. Fabulous use of one of the new plastic styles! Looks like that was a super vacation. Really excited to possibly get a chance to try the new plastics myself. Thanks to all involved in these giveaways! You are all so generous! 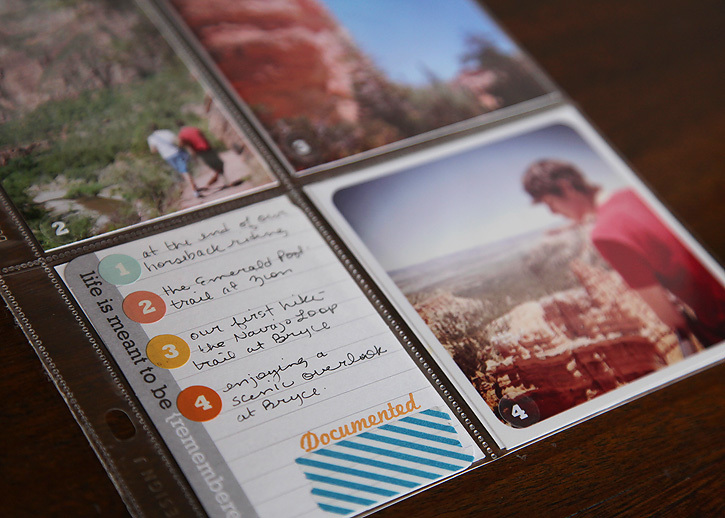 I really love how your project life IS about your photos first and foremost- thanks for sharing. Thanks also for a chance to win some of the new plastics. Thanks for a chance to win ... I was enjoying your vacation photos so much I almost forgot to enter! I love your vacation layout! I really like your Utah state card - what a nice touch to your layout! And thank you for the chance to win some fabulous Project Life products! Thanks for the chance to win!! Love your vacation pictures! The state cards are cool!